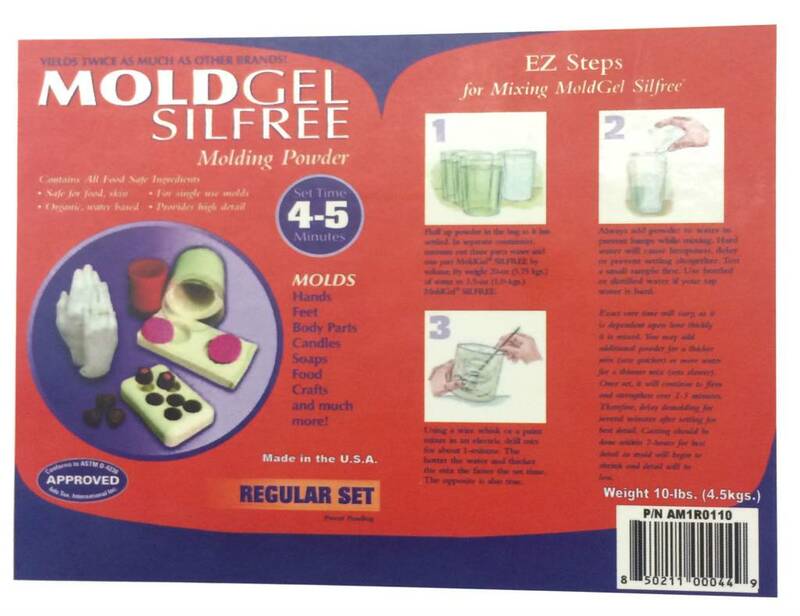 MoldGel - 3-5 Minutes Set - alginate mixes easily into a smooth, creamy consistency providing forensic detail down to the fingerprints. Regular Set gels in approximately 3-5-minutes. Its 3-to-1 (water to MoldGel) mix ratio means 1-lbs. (0.44 kgs.) of MoldGel yields 4-lbs. (1.8 kgs.) of high-coverage mold rubber. This is the right choice for smaller applications such as hands, feet and faces or craft molds and small taxidermy pieces. MIXING AND CURING: Weigh or measure proper amounts of MoldGel Regular Set powder and 80 F. / 27 C water. Mix together rapidly, but avoid whipping in air. A turbo mixer on a variable speed drill is recommended. Thicken with more powder, thin with more water. Apply to surface with a flowing motion pushing air out ahead of material. Optional liquid retarder may be premixed with water to extend working time. See chart below. MoldGel will not bond to itself unless the previous mix is not completely set. Thus, a large mold requiring more than one mix should be made by mixing a series of mixes within five minutes of one another. 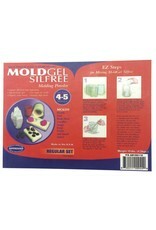 Bonding can be accomplished on gelled MoldGel by spray or painting Algislo. You can also embed fiber into MoldGel to secure the shell. As soon as MoldGel is firm, mix and apply a mother mold using plaster bandages or cheesecloth and diluted plaster. When plaster shell is set, remove the mold. It is recommended that a positive casting be made within the hour, as MoldGel will begin to loose detail as it dries.